This Oriental rice salad recipe is both healthy and delicious. Easy to make on hot summer days, it is one of my favorite summer salad recipes. Cook the rice according to package directions or start with leftover cooked rice. In a large bowl add rice, bean sprouts, raisins, red pepper, green onion, celery and mushrooms. Add spinach and cashews and toss gently. In a small bowl blend soy sauce, oil, garlic and lemon juice. Pour over salad and toss well. This rice salad tastes even better if left to marinate for an hour or so before eating. You can switch things up a bit by replacing some of the vegetables with finely chopped snow peas or chinese cabbage. If you really need this to be gluten free, please make sure you are using a gluten free soy sauce. Some are not. 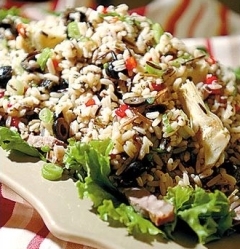 Cold rice salads are a nice change and a great addition to a buffet table or barbeque menu. This one is also very healthy, with lots of fresh vegetables. Use brown rice to make it even healthier. Feel free to vary the vegetables to suit your taste. The raisins add a bit of sweetness but you can leave them out or substitute chopped apricots. If you like this recipe, I’d love you to Pin it to Pinterest, Tweet about it, Like it on Facebook and leave a comment and your own recipe to share below. For more salad recipes like this rice salad recipe, look here. I was looking for something different, so tried this salad and quite liked it. It was easy to make and very filling. I would rate it at 4. I will make it again but will change the amounts of the dressing ingredients to 1/2 cup soya sauce, 1/4 cup oil and 1 tablespoon of lemon juice.